If it was powered by your FireWire or USB cable, you could forgive the Plextor's lack of speed. But it's not. 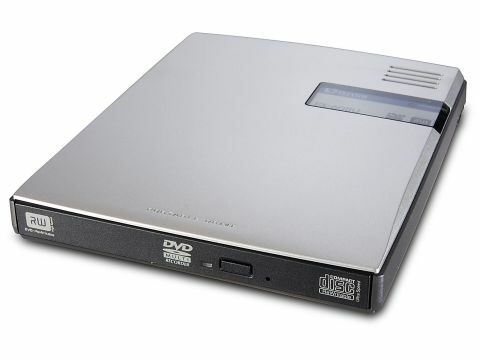 A portable DVD drive like this one from Plextor has obvious advantages, even for desktop users. If you only need to burn DVDs once in a while, it makes sense to get a pocket-sized drive that you can slide into a drawer when you don't need it. And when you're on the move, of course, the last thing you want is to be saddled with a desktop drive the size of a sandwich box. However, the Plextor provides only half the answer. Yes, it's small and compact, but the obvious thing would surely have been to make it bus-powered? As it is, the Plextor needs a mains cable and adaptor, just like all those bulky desktop drives. That might not be much of a hardship when you're working at your desk, but when you're out and about on the road it's another story. We could probably forgive the Plextor for this if it wasn't also so darned slow. It took over six minutes to grind its way through our 500MB DVD R write test, making it slower even than the bus-powered LaCie Slim. It struggled during our iTunes test, too, taking over seven minutes to burn an audio CD when its rivals were taking around four. While the Finder, iTunes and iDVD recognised the Plextor without difficulty, it's not labelled as a Mac-compatible drive and doesn't come with any Mac software. Given this, things don't look good for the Plextor at all. It's a fraction cheaper than the Mac-friendly LaCie Slim, but not by enough to make it at all appealing. Worse, it's undercut by the USB 2.0 version of the LaCie drive. At its launch, Plextor was able to boast that this was the smallest portable DVD writer on the market. However, its lack of speed and reliance on an external power supply rule it out as far as we're concerned.